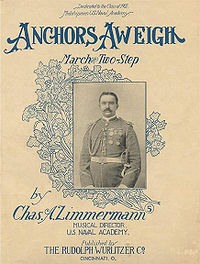 Anchors Aweigh is the song of the United States Navy, composed in 1906 by Charles A. Zimmerman with lyrics by Alfred Hart Miles. Zimmerman was at the time a Lieutenant, and had been bandmaster of the United States Naval Academy Band since 1887. Miles was a Midshipman First Class at the Academy, in the class of 1907, and asked Zimmerman to assist him in composing a song for that class, to be used as a football march. The song was first played during the Army-Navy football game on December 1, 1906, at Franklin Field in Philadelphia. Before a crowd in excess of 30,000 Navy won the game 10-0, their first win in the match up since 1900. The song was gradually adopted as the song of the U.S. Navy; although there is a pending proposal to make it the official song, and to incorporate protocol into Navy regulations for its performance, its status remains unofficial as of 2006. Its lyrics were considered too specific to the Academy and not representative of the Navy at large, and so were rewritten by George D. Lottman (note the reference to "farewell to college joys"). Its melody was also slightly rewritten by Domenico Savino. Farewell to foreign shores, We sail at break of day, of day. Until we meet once more. Here's wishing you a happy voyage home!